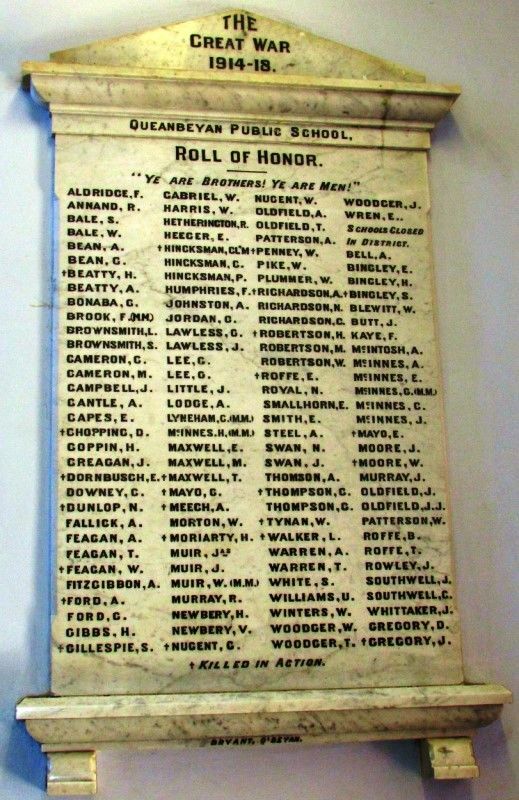 A marble honour roll commemorates former pupils of the school and other schools of the district who served in World War One. Queanbeyan Superior Public School's Roll of Honor was unveiled on Wednesday afternoon in the presence of the school children and a representative gathering of citizens, who were present at the invitation of the Parents and Citizens' Association. Several apologies were tendered for persons unable to be present. The chair was occupied by Mr. C. T. Campbell, who, as President of the P. and C. Association, performed the unveiling ceremony. The Honor Roll contains the names of no less than 126 soldiers, 98 of whom were ex-pupils of the Queanbeyan school, the remainder being ex pupils of schools closed in the district. Of simple and chaste design in white marble, the Honor Roll is something to be proud of, and will be a lasting memorial of the brave men whose names are inscribed thereon, several of whom paid the supreme sacrifice. The National Anthem having been sung Mr. Campbell said they had met to unveil a memorial to the ex-pupils of the local and district schools who had served in the great war. The school children held a bazaar about 18 months ago at which funds were collected to defray the cost of the memorial, but until recently a temporary roll of honor had reposed in the school. On the cessation of hostilities it was decided to erect a suitable tablet, which would be a lasting memorial of the heroic men who had fought for them. The Parents and Citizens' Association appointed a committee, who, after receiving specifications and designs, chose the one supplied by Mr. Bryant, and the tablet before them that afternoon was a tribute to his skill as a sculptor. The names of the men engraved thereon would be handed down to posterity. When the Germans set out to dominate the world they overlooked the thin line of kinship which permeated the Empire, and men from all its branches fought for honor and liberty in the hour of trial. They would ever honor and revere their names, especially those of men who had paid the supreme sacrifice. He was proud of the honor and privilege of unveiling the Honor Roll. As the Union Jack fell aside, revealing the beautiful memorial, the hymn, "Lead Kindly Light," was sung by all assembled.
" Ye Are Brothers ! Ye Are Men ! "